Coconut lovers will love these delicious and light crunchy chocolate coconut cookies! Today I want to share a light, crunchy cookie with desiccated coconuts, dipped in melted chocolate. When I made these cookies without coconuts and my grandmother ate them, she had a comment; these would be good with coconuts too. I listened her and add coconuts to my cookies. I use low amount of sugar and butter which make the cookies light. You can feel the coconut but it is not overloaded. If you like to make it without coconuts, you can make it, they taste really good and also have a smooth texture. 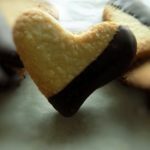 I love heart shaped cookies dipped in melted chocolate, so I make my cookies this way. Again, the steps are easy. First I cream the butter and sugar, and add the egg. Then I add the dessicated coconuts and mix well. Finally I add the flour and mix well. I divide the dough in half and shape each into a ball. I put them into the freezer bags and flatten them. It is easy to flatten them with a rolling pin. I keep them in the refrigerator for 15 minutes to let them rest. I remove the doughs from the refrigerator. First, I lightly flour the work surface and rolling pin and roll out the doughs into 6*10 inch (16*25cm) rectangle, 1/6 inch (4cm) thick. Later, I cut out with my heart cookie cutter and place them on the baking sheet covered with parchment paper. I form the leftover doughs into a ball and roll out and cut out again. I repeat the steps until no dough remains. If you want, you can use alternative cookie cutters or just cut the doughs into squares. I bake for 10 minutes until the edges are getting dark. I remove the cookies from the oven. While the cookies are cooling. I melt the chocolate over bain marie. Then I dip almost half of each cookie into the melted chocolate. I place them on the baking sheet covered with parchment paper and let them cool. These chocolate covered delicious coconut cookies are crunchy and light. Place the butter in a large bowl and beat on medium speed for 1 to 2 minutes until it is soft with a hand-held mixer or with paddle attachment if using a stand-mixer. Add the sugar and mix until creamy. Then add the egg and mix well. Stop the machine and scrape down the sides of the bowl during these steps with rubber spatula to be sure they are all mixed. Add the coconuts and mix well. Then add the flour and mix until all incorporated. Divide the dough in half. Flatten and put them into freezer bags or wrap with plastic film and keep in the refrigerator for 15 minutes to rest. Take the doughs from the refrigerator. Flour the work surface and rolling pin and roll out the doughs into 6*10 inch (16*25cm) long rectangle, 1/6 inch (4cm) thick. 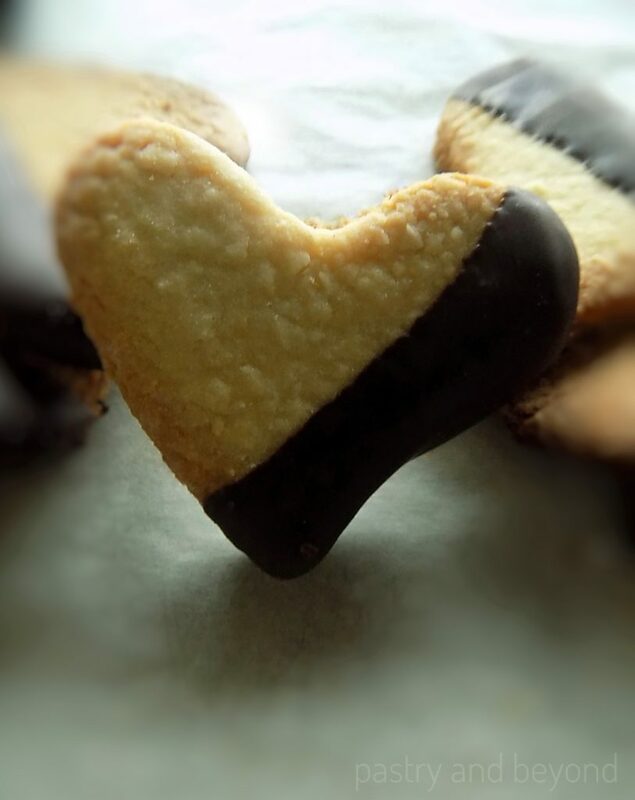 Use a heart cookie cutter (or another cookie cutter or just cut into squares) and cut out and place them on the baking sheet covered with parchment paper. Form the leftover dough into a ball and repeat the steps (roll out and cut out the dough) until no dough remains. Bake for 10 minutes until the edges are getting dark. Remove the cookies from the oven. While the cookies are cooling, melt the chocolate over bain marie: place the chopped chocolate into a heat proof bowl that sits over a pan of simmering water. Stir often. Dip half of the cookies into the melted chocolate. Place them on the baking sheet covered with parchment paper and let them cool. The chocolate covered cookies will set in 5 minutes in the refrigerator.